Creativity is the key to prosperity. It involves breaking out of established patterns to visually examine things in a different way and passion is one great force that unleashes creativity. At Bhavans, we encourage creativity to a substantial level because we believe learning and creativity are like childhood friends. Creative Hat Day is one such celebration of creativity. Indeed, the little kinders cannot create by themselves, but that’s where the parents and children work together. It fortifies their bond of love and understanding. 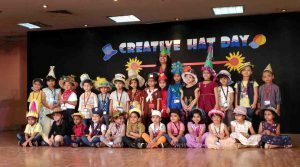 The entire kindergarten wing at IES Bhavans and Jack & Jill Nursery Branch of Bhavans at Mangaf celebrated Creative Hat Day on 10th May 2018.The dazzling kinders flaunted their beautiful hats with great vigor and exhilaration. They came dressed in outfits which coordinated well with their beautifully created hats that adorned their heads. Many of the hats were handmade depicting sundry themes like conservation of animals, forest and water and so on. The gleaming faces of the little ones when they were escorted on to the stage of the auditorium, with their teachers were worth watching. There was a creative hat ramp walk with a peppy music being played in the background. The teacher with her class danced and waved and finally posed for a class photograph. It was a spectacular exhibit of ingenuity! After all the classes were done, a group photograph of all teachers of kindergarten was clicked. As it’s with every celebration in kindergarten, the main bulletin board was beautifully decorated with miniature creative hats and the class activity was done by the children of LKG &UKG. The little ones proved that whenever you wear a hat your day becomes special. They went back home with everlasting memories of the day full of fun and frolic. Previous Mother’s Day Celebrations at the Kindergartens of Bhavans.